When a person is dying, his immediate relatives call a parish priest or a pastor to give the last sacrament. It is also the time when the dying person could ask for blessings or forgiveness. Dying people should ask for a confession from a priest. The Aklanons believe that there is life after death. In this critical moment, a cantor or a member of the church choir is asked to sing religious songs to make his final journey pleasant and perhaps to ease whatever pain the dying person is suffering. If a person dies, his immediate family would inform all his relatives of the incident as well as the parish priest. Upon the priest’s instruction the sacristan would toll the bells. The purpose of this is to inform people in the community that somebody had died. The townspeople who would hear the tolling of the bells are expected to pray for the repose of the soul of the dead. The intervals between strokes of the bell’s tolls would determine the age of the deceased. If the strokes are done briskly, the deceased is a child. If the intervals are long, the dead is an adult. Before the 1960s, burial was usually done twenty-four hours after the person has died. But with the popularity of embalming, burial is done within weeks especially when a member of the family is away and is expected to come home. It is believed that with shoes on, the journey of the dead will be difficult and he will be damned in hell so the deceased is not allowed to wear shoes, only socks. Dutlan ka gid Inday ku akong paghigugma. Like the bordon, konggit is played only during the wake. The game is played with small stones, as big as marbles. The number of players range from two to five. Before the start of the game, the participants would first decide via a jack en poy. Those stones which were not caught could still be taken by the player if he is able to strike two stones, which were previously pared by putting an imaginary line between them. If he fails to strike the other stone, the next player continues the game until all the stones are taken. Each player then counts all the stones he/she has taken. Whoever has the most number of stones is declared the winner. Another round of konggit is played. These games are rarely played now during the wake. What are popular these days are mahjong, tumbo, and card games like pusoy dos and lucky nine. When there is death in the family, the family members are expected to mourn by wearing black clothes. Others would wear black ribbons. In case the deceased is a mother and has left a child, the child should wear a piece of red cloth so the parent would not disturb the baby at night. Another practice of mourning is by hanging a black cloth on the window facing the street. Members of the family are not allowed to take a bath until after the burial. They are not allowed to sweep the floor also. This is to prevent another death in the family. Children are not allowed to listen to radios. No social gatherings should be held during this period. Weddings are also postponed until after a year to avoid bad luck to the newly married couple. The deathbed of the deceased and the clothes worn during his death are thrown outside the house to rot. If he died on a bed made of bamboo thatches, one thatch is removed and thrown away. This is to prevent another death in the family. 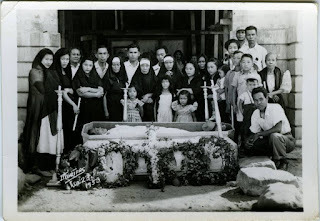 When the deceased is brought out of the house for burial, all the members of the family should pass under the coffin. This is done to prevent the spirit of the dead to disturb those who are left behind. When the coffin is being brought out of the house, the feet portion of the coffin is put forward as if the deceased person were passing through the door himself. Care is being taken cared of to prevent the coffin from bumping any portion of the door so as not to disturb the soul of the dead. If the deceased is a Catholic, he is brought to the Catholic church for blessing. 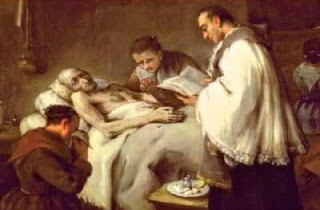 Mass is offered for the repose of his soul if the cause of the death is suicide, the priest will not allow the dead to be brought inside the church. At times, a priest is requested to welcome the deceased at a crossroad nearest the church. Then, mourners would walk toward the church. In the church, the coffin is opened for the mourners to make a final view. It is understood that no tears should drop on the deceased’s face because it will only make his journey difficult and will cause bad luck to the family. Picture taking is done and eulogies are said, if there’s any. Procession continues to the cemetery. Again, great care should be observed so as not to bump on any part of the coffin on the church’s door. Also, the feet portion is put forward while leaving the church. On the way, people who are at the streets usually pray for the repose of the soul of the deceased. Others would take off their hats or make a sign of a cross. 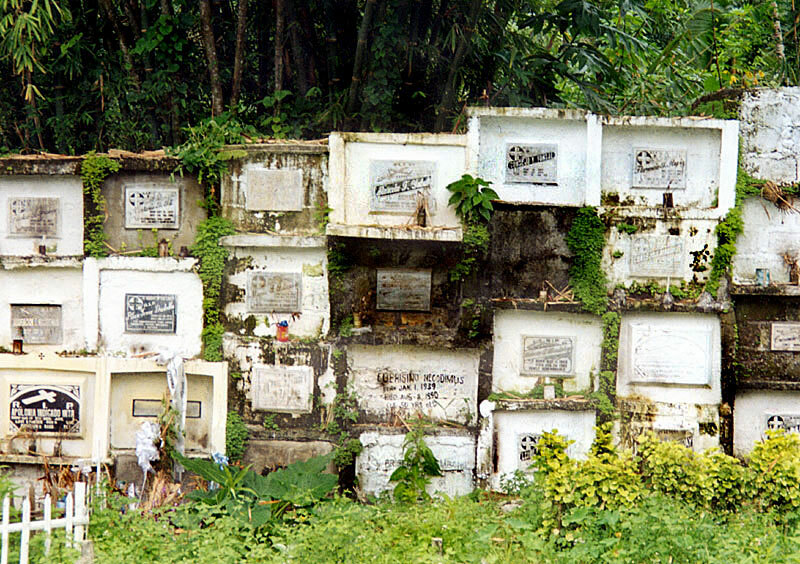 In Zamboanga City, I observed that people in the streets would throw coins to the passing coffins. These are picked up and given to the family of the deceased. Upon reaching the cemetery, the coffin is again opened for the last time. Here, people would come very close to the coffin, particularly the immediate members of the family. Pins and other decorations inside the coffin are removed and thrown away so as not to make the journey of the deceased difficult. Loud crying is usually heard. Mourners would start throwing flowers and a handful of soil to the coffin as pabaon. Then the coffin is closed and nailed. The coffin is then lowered into the grave or entombed in the pantheon. 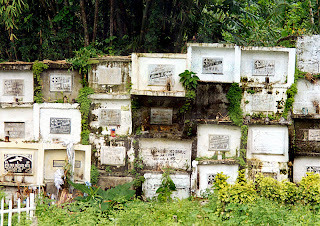 Snacks are served inside the cemetery. Upon leaving the cemetery, mourners would pass through the smoke prepared near the gate. This is done to prevent any illness that would befall the mourners’ family, especially when there is a child in the house. If no snacks are given in the cemetery, the mourners are expected to go to the house of the deceased to eat. From the day of the funeral, a nine-day novena is held. People in the neighborhood would come to pray, play, and so to gamble. As usual, the bereaved family serves drinks and foods to those who come. 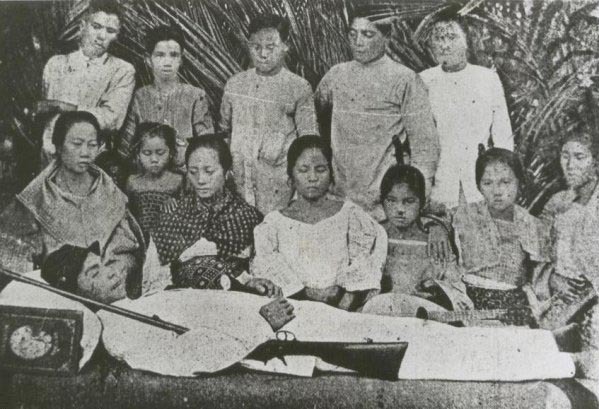 In the beginning of the 1960s, much changes have taken place on the beliefs and practices on death among Aklanons, particularly among the later generations. Today, bordon or konggit is seldom played, but mahjong, pusoy dos, and tumbo games are popular. As noted earlier, so much foods are served during the novena, the patnog, and the katapusan which cause so much spending. This is an added burden to the members of the bereaved family who are already economically drained. Aside from this unusual and untimely spending, activities like planting, and harvesting of palay are suspended until after the burial which can affect the family’s income.